Please support our sponsor: Apex Race Parts. Best wheels out there right now! Another incredibly happy customer. Had to request a replacement wheel for one of mine that was damaged during an off at the track and they're shipping one overnight for free! Can't be customer support like that! APEX is excited to introduce our new Performance Services division, with our first location now open in Dublin California. As with our products, we are concentrating on Street, Track, and, Race services. With our experience in complex fitments and car setup we saw an opportunity to develop services with the same APEX focus on creating optimal performance. 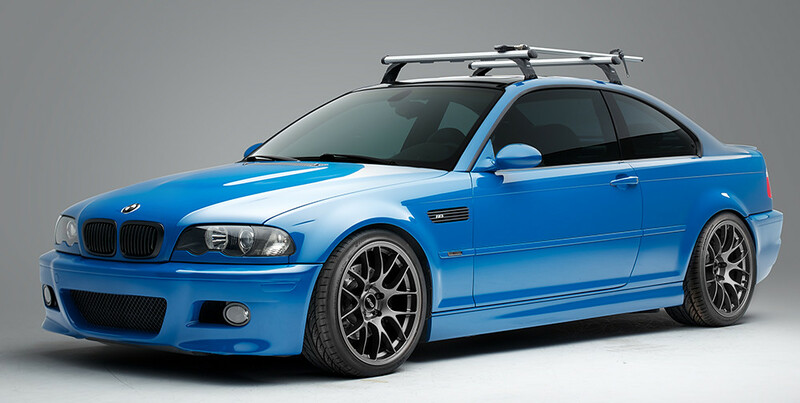 By joining forces with Edge Motorworks, a well-known BMW performance shop, we now deliver services from custom alignment and suspension installations to complete race builds and all of your general maintenance needs. Our state-of-the-art equipment combined with the extensive knowledge and experience of EDGE Motorworks, guarantees your services and modifications are beyond expectations. Being in the wheel industry we know how important mounting, balancing, and alignment equipment is and have invested in the finest available. Racing, track day drivers, and street performance cars have unique requirements. Our alignment, suspension tuning, wheel and tire, and brake services are customized for each car and driver to target specific requirements, which maximize driving potential. With our years of combined experience in selling components and delivering service, we have experienced, installed, and raced any kind of aftermarket part you can think of. This ensures APEX Performance Services will know exactly what maximizes the potential of any modification you have in mind. The Auto34 leverless mounting system with its leverless tool head, center clamping, and auto-sensing rollers ensure your wheels are never damaged during mounting. Additionally, this system allows us to mount tires with any profile, from Run-flats to racing slicks just as easily as traditional tires, all without charging premiums. Our Hunter, RoadForce balancing equipment diagnoses and solves problems other systems cannot. By simulating real driving conditions with a pressurized roller – only found on RoadForce equipment – we are able to achieve perfect uniformity and deliver that new car ride. Our Hunter Hawkeye Alignment system delivers precise and customized alignments. With this system and our focus on customized services, we can optimize your alignment for performance handling, track-specific requirements, or tire wear and fuel economy. 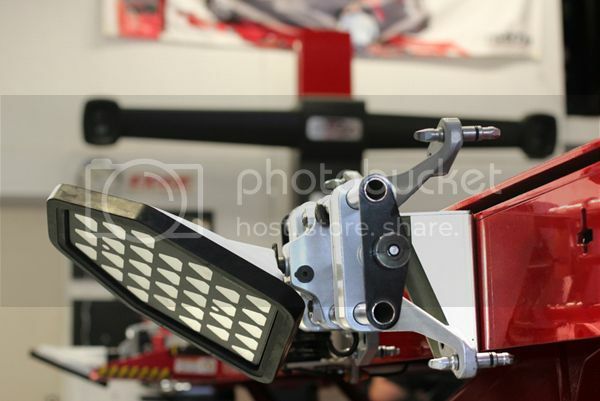 All our alignments share the same attention to detail, for example: whether we are corner balancing a race car or making sure you achieve the best gas mileage possible, your weight is simulated in the driver’s seat. BMW E36 M3 “25 Hours of Thunderhill” car. The first build targeted at the 25 Hour: Dual fuel fillers, built for reliability, lower power but lighter weight. We’re going for the win, and with a 3rd and 2nd already under our belt, this is our year. BMW E36 M3 dedicated track car and NASA TT Beast. A streetable car with a complete suspension replacement with chassis reinforcements and race bushings. We’ll be posting progress on these and other builds so make sure to keep tabs on us to follow our progress. Call EDGE Motorworks today for a free Apex Performance Services consultation. We’ll gather all the necessary information to create a plan optimized for you: (925) 479-0797. 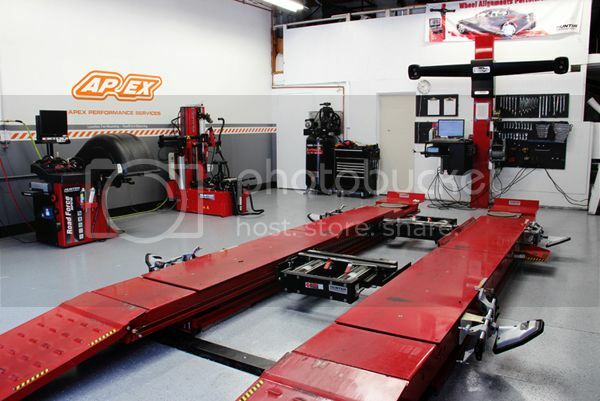 Receive a $30.00 discount on an APEX Performance alignment, or mount and balance, until Sept. 15th. APEX is excited to announce the addition of new 19” sizes to our EC-7 line of wheels, arriving in June and available for pre-order via Group Buy later this month. Originally designed as an endurance race wheel, the EC-7 styling has become extremely popular in performance street applications on all BMW models. We’re continuing our philosophy of durability, fit, and performance with new design improvements and fitments that are ideal for aggressive street applications. These new 19” widths and offsets are more aggressive than our track-oriented 18” sizes, and allow for a more flush fitment. Wide widths and specialized offsets make sure these wheels are still a big step up in tire sizes and performance, not just an aesthetic upgrade. The wheel’s design has been tweaked to further enhance functionality and appearance. The center pad depth has been increased on all sizes to further accentuate spoke concavity. Inner lips were thickened to increase strength and better handle the abuse from low profile and stretched tires. These wheels include a newly redesigned sleek black center cap made from a more heat-resistant material for increased durability in track environments. Of course, OEM center caps and TPMS sensors still work perfectly. An optimized car setup begins with the perfect wheel fitment. Without the ideal fitment, your car's performance potential is always compromised. 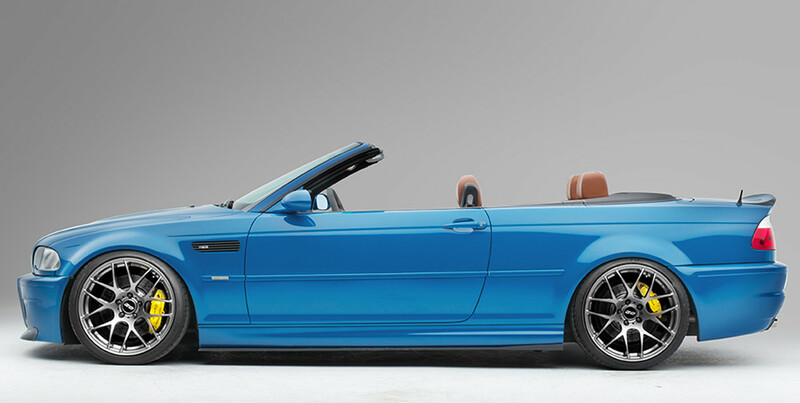 With this in mind, we’ve added 10 new 19” BMW-specific fitments to compliment our 13 existing 18" sizes. 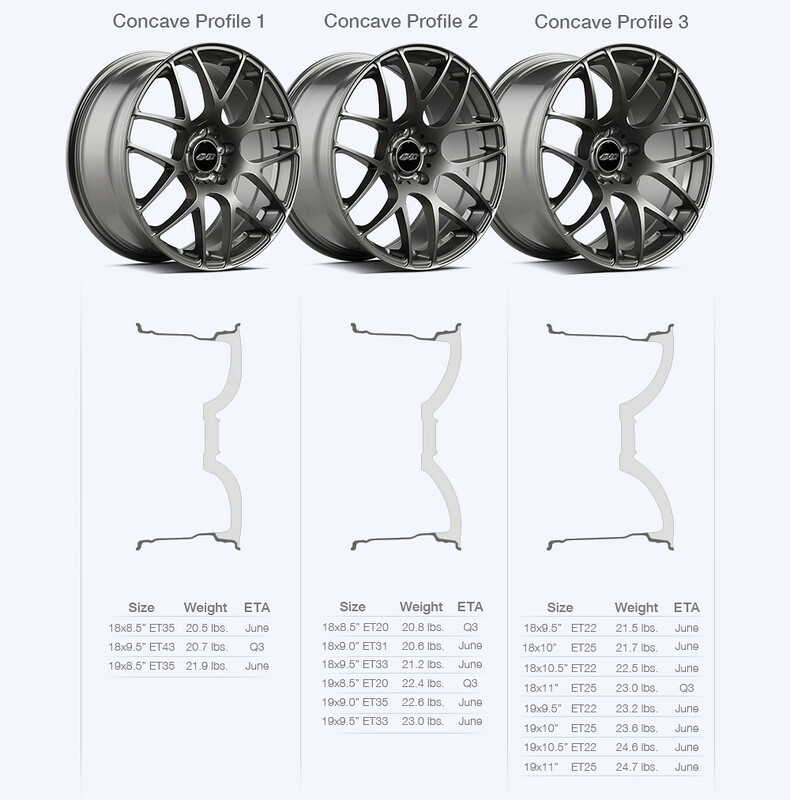 The 19” EC-7’s are produced using three unique face profiles ranging from moderate to extreme concavity. 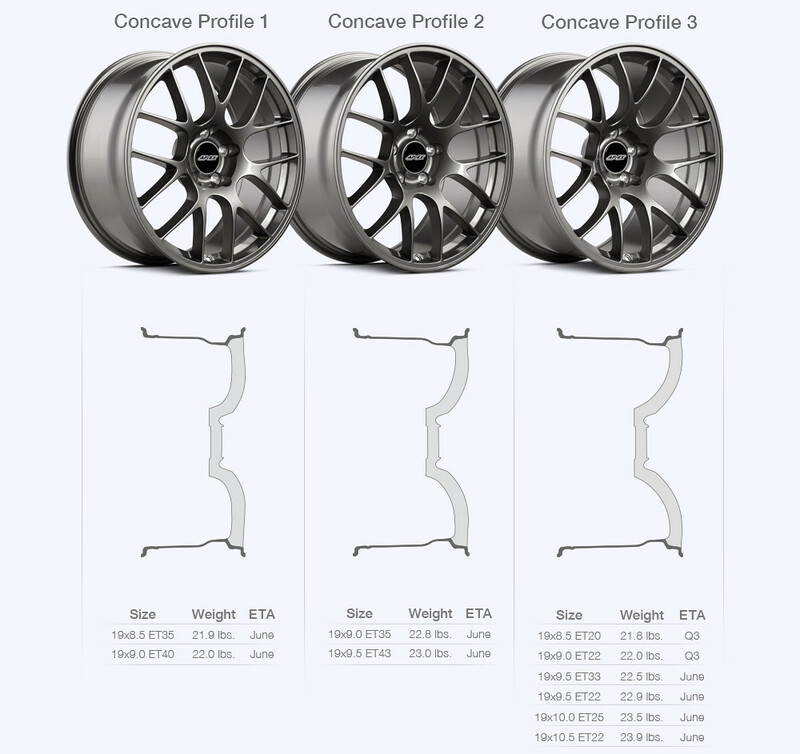 This wide range of vehicle-specific 19” fitments allows for maximum concavity, proper caliper clearance, wider tires, and an overall ideal setup. The EC-7 wheel line was originally created to address the concerns of more and more racers and track day enthusiasts: long term durability, fit and performance. With the increase of faster and heavier cars being used in racing, HPDEs, and spirited driving, the EC-7 was designed and engineered to handle extreme abuse on the track & street and offer a wide range of direct fitments, all while producing a lightweight wheel. We’ve taken these strength and endurance features even further with the 19” line to produce a very stylish and functional wheel. Just like the rest of the APEX wheel line, the EC-7 is once again produced using the Flow-Forming technique. Flow-forming, which has also been called “Roll Forging” or “Spin Forging”, produces a barrel with similar strength to that of a fully forged wheel. This significantly reduces weight in the barrel, which has the greatest impact on rotational mass. We’ve produced an even stronger wheel by combining the strength of the lightweight barrel with a more robust face design. The EC-7 welcomes endurance racing and potholes. 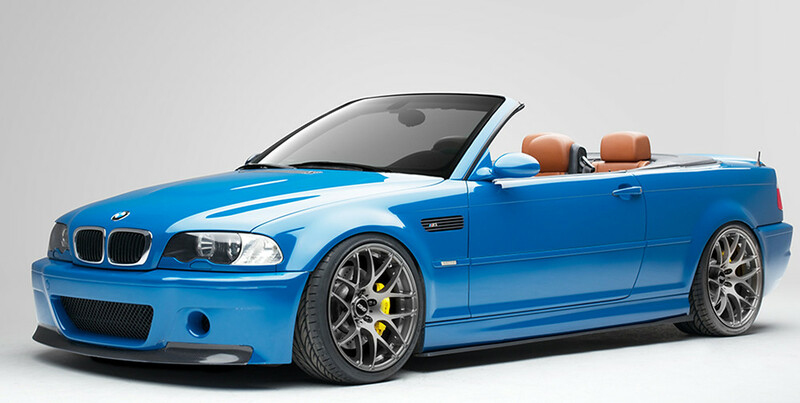 Designed for BMW applications, the EC-7 accepts TPMS sensors, factory lug bolts or stud conversion kits, and OEM roundel center caps. All wheels come with new APEX black center caps. Pricing will be announced shortly. 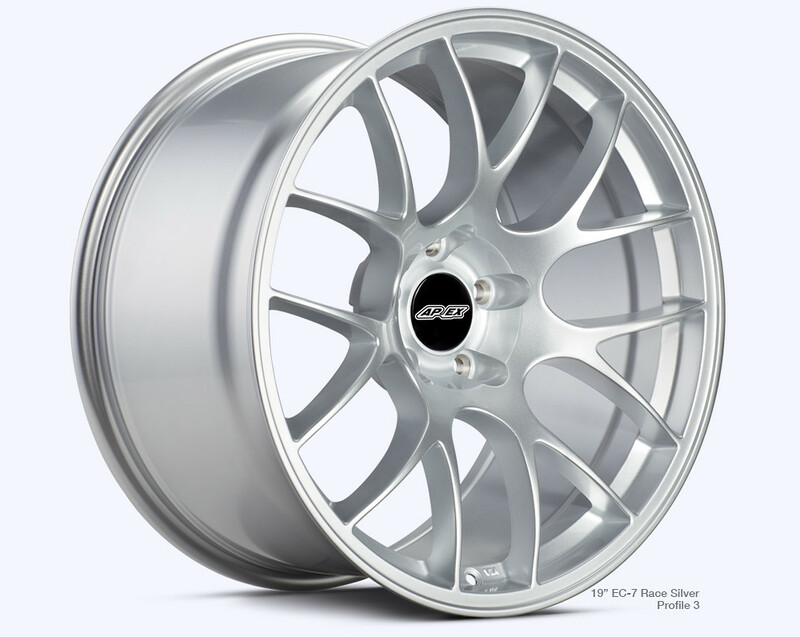 19” EC-7 wheels will begin arriving in June. Not all sizes and finishes will arrive with the first production batch. Some will arrive 30-90 days later. Details regarding our Group Buy Pre-Order will be posted soon. 2 year Structural, 1 year limited finish warranty guarantees wheels will be free from defects in materials, workmanship and paint finish under normal and reasonable use. 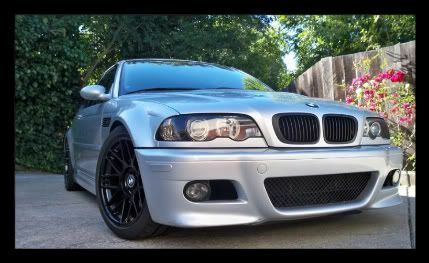 whats the recommended size/fitment for the e46 m3? 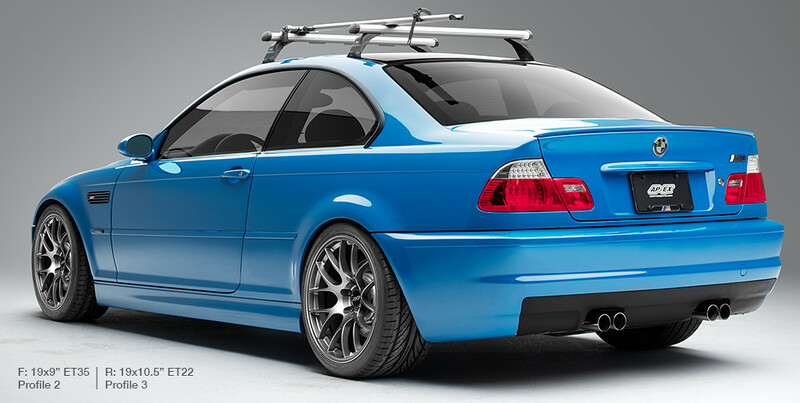 On the e46 M3, you have the option of going with either the 19x9" ET35 or the 19x9.5" ET33 fronts, paired with the 19x10" ET25 rears. These wheels can be used with a 245/35/19 (19x9" ET35) or 255/35/19 (19x9.5" ET33) front and 275/30/19 sized street tires. 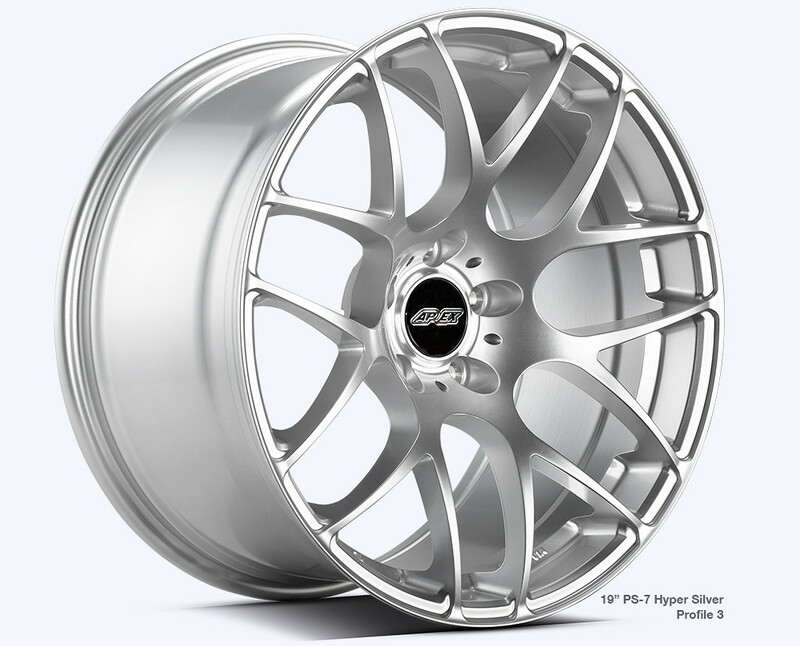 The APEX PS-7 is the first of a new line of lightweight, street-focused wheels arriving in June in BMW-specific fitments. The development of this new line will allow us to continue developing track and race-specific designs separately, while also bringing our expertise and lightweight technology to the typically heavy and aesthetically focused street market. The PS-7 brings long needed improvements to a mesh design that’s been seriously lacking in features, and left enthusiasts with only heavy alternatives. Just like the rest of the APEX wheel line, the PS-7 is once again produced using the Flow-Forming manufacturing process. Flow-Forming, which has also been called “Roll Forging” or “Spin Forging”, produces a barrel with similar strength to that of a fully forged wheel. This significantly reduces weight in the most significant part of the wheel, as it has the greatest impact on rotational mass. Even with key strength improvements that add weight in select areas, static weights are reduced by 20% on average versus cast alternatives. More aggressive wheel widths and offsets were selected versus our line of race-oriented wheels, allowing for a flush fit without spacers. Initially available in 18” and 19” diameters, the PS-7 is produced using three unique face profiles with increasing spoke concavity. We designed these these face profiles to significantly increased concavity on many applications that are traditionally more conservative. 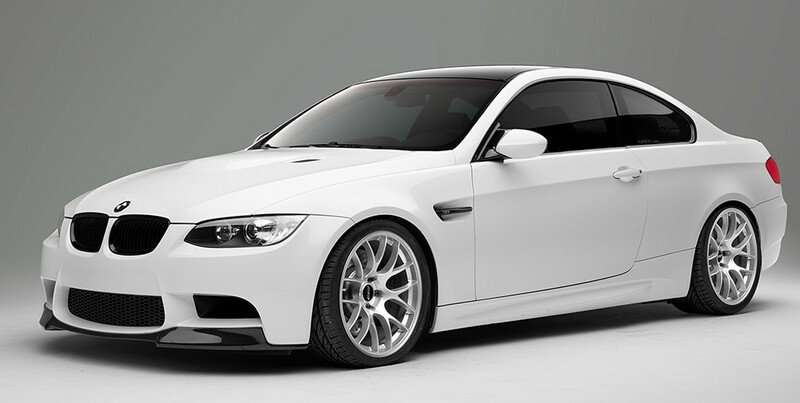 A total of 17 BMW specific sizes in three finishes are initially being released. Strength improvements were made to help specifically address the unique abuses of the street where low-profile and stretched tire fitments are used. To help fight wheel bends, we’ve increased the thickness of the wheel’s inner lip. Load ratings exceed JWL requirements, and all sizes have been crush tested in Japan, earning them official VIA certification and registry marks. Additionally, the barrel’s diameter increases sharply after the drop center, improving big brake kit clearance. The PS-7 also accepts OEM Roundel center caps, TPMS sensors, and comes with our newly redesigned gloss-black APEX center caps. Performance luxury vehicles deserve much more than heavy cast wheels. The PS-7 combines racing inspired lightweight engineering with desirable street styling, to produce the ideal wheel of choice. 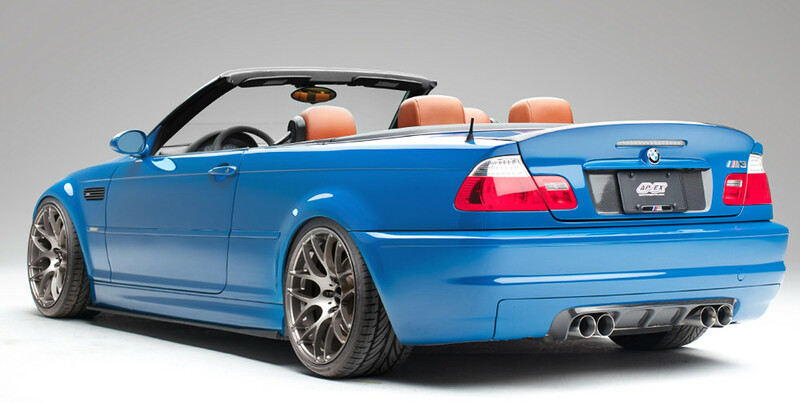 Pricing and discounted pre-order details will be released the week following Bimmerfest. Follow us on Facebook or check back here for sign-up and participation details. Orders will begin shipping in June. All times are GMT. The time now is 04:18:28 PM.